This Serta Perfect Sleeper Brightmore firm mattress was an excellent choice. I had researched so many new mattress types through Consumer Reports. So glad I purchased this one because I get such a comfortable night’s sleep! 1. Helps reduce tossing and turning with Cool Twist Gel Memory Foam 2. Encourages proper back support and alignment with Serta's 886 Custom Support Firm Individually Wrapped Coil Innerspring3. Promotes a balanced sleep temperature with an overall Mattress design that helps promote airflow4. Minimizes impact from partner movement with a premium support system and advanced foams designed for motion isolation5. 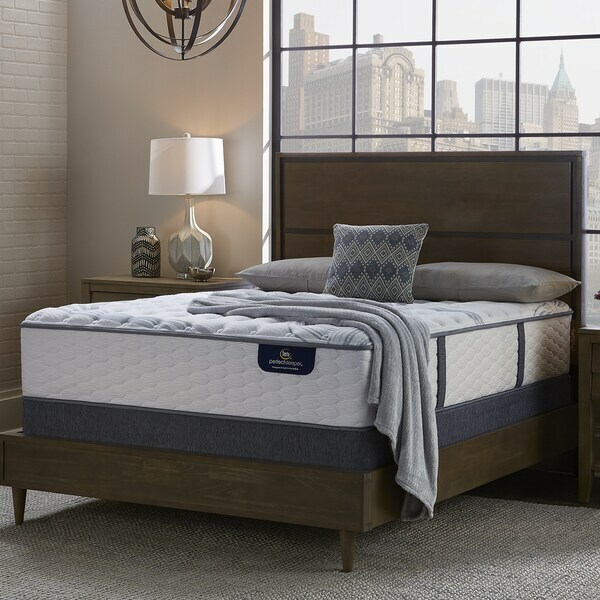 Resists sagging and edge roll-off with Serta's ComfortLast Construction and Best Edge Foam Encasement This Mattress also features an extra-thick layer of Serta Support Foam, which combines gentle cushioning with extra support for more firmness throughout the Mattress. Let me tell you this, before buying this mattress I had so many issues falling asleep and also back pain, because I was sleeping on a piece of garbage from Ikea. This mattress is a blessing for me, this is a top-notch quality mattress, and the price couldn't be beaten. When my husband moves , I don't feel anything, and this is great.I would give it 10 stars if I could, I am all about this mattress, couldn't be more happier with my purchase. I recommend it to anyone who wants a perfect sleep!!! THE MATTRESS IS VERY FIRM AND THE 12 INCH THICKNESS IS EXCELLENT. THE HEIGHT IS PERFECT WHEN GETTING OUT OF THE BED. DELIVERY WAS ABOUT 1 WEEK. I love this Serta Perfect mattress, it is firm, comfortable, 12 inch tall it is very good don't need base, excellent product and very good price.I recommend this matress. I bought a very expensive memory foam & gel mattress & box spring set from a furniture store 3 years ago. I hated it within 3 months The sale person convince me it was the best thing for chronic back pain. WRONG! But i just couldn't justify replacing such a expensive purchase. I wish I had ordered this mattress years ago. I have slept on it for 5 nights & it's the best sleep I've had in years. This mattress is VERY firm. For those who wish a VERY FIRM mattress -- you got it! For me, the disappointment is great. I winged it last time and bought the Serta Delphina (no longer in production) -- and LOVED it --for 7yrs. When it was time for a new one (given I had such a good experience the first time)--I Overstocked it again. Big mistake. First, most of the pictures are all stock photos they do not accurately depict the actual mattress (take a look, apart from the first "bed" shot-- all Serta ads show the same mattress with a pillow top and an identical video). Also, (which I only recently learned), Serta tends to run firmer than Sealy or other brands. So I thought I wanted a firm (for the support) in fact I should have chosen "medium" OR ensured that the firm came with some kind of plush/pillowtop addition. Oh well. Lesson learned. After sleeping so well (for the first time in my life!) on the Serta Delphina, I am now stuck with this brutally hard/nurse Rachett mattress. I can't believe I'm going to have to buy another one -- this time the proper way... IN PERSON in a store If you can afford to roll the dice, you could get lucky on Overstock! Good luck! (But don't get sucked in my all the positive reviews -- it's YOUR back and YOUR sleep style that matters). Very firm. Love this mattress. Great back support. I love the mattress!! It is very firm, High and comfortable. My fiancé is not 100% sold but we are enjoying it. Didn't arrive as quickly as expected. However, after you received it you will forgot the long wait time. Money well spent. Hope it last for a very long time. If you are looking for very firm this is the way to go. This is a comfy mattress... and beware, this was only the mattress, not a set. That was a bit disappointing, but I had to simply buy a foundation. It seems to be thicker than 12", but it isn't. It has handles on the long sides of the mattress which make for easy maneuvering. It seems firm enough for me since I prefer extra firm, so I cant wait to sleep on it! More later! I am very happy with this mattress. It was delivered on time, clean, and without damage. It IS firm, so if you usually have issues with hips or shoulders aching on firm mattresses, you may want to add a foam topper or something to take the edge off. The support is great and I was very happy with the quality of materials. I have heard some people mention that their mattresses have come with weird, strong smells, but other than smelling new, I haven't had any problems with it. 10/10 would recommend. Happy camper. I wanted a new firm mattress. This mattress is so comfortabel if you like firm mattress. I have a pedistal frame fits great, looks great. It does have a littel pillow top but it is still nice and firm. This is in our guest room, and this bed is now our favorite!! My spouse and I work different shifts so having a comfortable bed available to accommodate our different sleeping schedules is fantastic. We let the kids sleep in the guest room as a reward for behavior and they think the bed is awesome! It is a great firmess. This is the worst mattress I’ve ever had. I initially bought it because of the rave reviews on orthopedic issues but it has heightened my back and neck pain instead. I was trying to give it some time thinking it would get better but I have now gone passed the return policy. It really isn’t a comfortable mattress at all. This mattress is exactly what we hoped it would be. I was nervous buying online and relying on product description and other reviews, so glad they were not misleading! My husband needed a firm mattress and I was OK either way, this mattress works very well for both of us. I love this mattress! I was hesitant to purchase a mattress without trying it in a store first. This mattress made me glad I did! I have low back and neck issues and this mattress is perfect for me. It is firm without being rigid and gives you great support while being extremely comfortable. The mattress is beautiful and well made with quality materials. I ordered it right around the Holidays and it took a little time to process my order but the delivery process itself was quick and easy. Love this mattress!!! Best purchase ever!!! Never ordered a platform firm mattress before, the mattress is very comfortable. I guess that's why it's called a perfect sleeper. You get a perfect night sleep very restful. And you get updates on when you can expect your order to be recieved. Which is very informative. Delivery was planned perfectly. The mattress is definitely firm. It may take awhile to break it in. I’d absolutely refer to a friend that likes extra support. The bed is exactly what I wanted. Firm but yet a softness to the top. the only downside is it took 4 weeks to deliver. "can you flip this mattress to the other side?" "Does the box spring come with the purchase of the mattress?" "what is the number of cols for this mattress ?" "Can this be used with an adjustable bed?" "I have the same question as below: Is there a box spring include with the Serta Perfect Sleeper Brightmore 12-inch Firm Queen-size Mattress? I have added the item to my cart but do not see any mention of a set." "Serta Perfect Sleeper Brightmore queen set price not clear. What is price for set?" Please add the item to your cart to see the price.